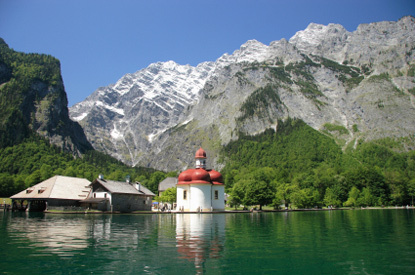 St. Bartholomew's Church facing the Königssee and Mt. Watzmann, Berchtesgaden National Park. Located in the southeasternmost corner of Bavaria, at the border of Austria, Berchtesgaden is the only German national park in the Alps. Covering 210 km², its elevation ranges from 600 m to 2713 m at Watzmann, the country's second tallest mountain by prominence, soaring above the emerald-green Königssee Lake. The park has a network of well-marked trails for hiking and cycling. It was designated a Biosphere Reserve by the UNESCO.